Nektar DAW Integration custom designed for Bitwig, Cubase, Digital Performer, FL Studio, GarageBand, Logic, Nuendo, Reaper, Reason, Sonar and Studio One takes Impact LX25+ way beyond functionality normally offered by a USB MIDI controller keyboard. With Impact LX25+ the hard work is done, so you can focus on your creativity. 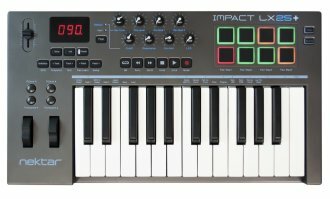 The 25 note velocity sensitive keyboard is a synth action, full-size, piano-style keys with a medium tension. A 30mm fader and 8 pots are at the center of the Impact LX25+ control panel. Each control is fully programmable to send any MIDI CC message for use with hardware or software MIDI products. 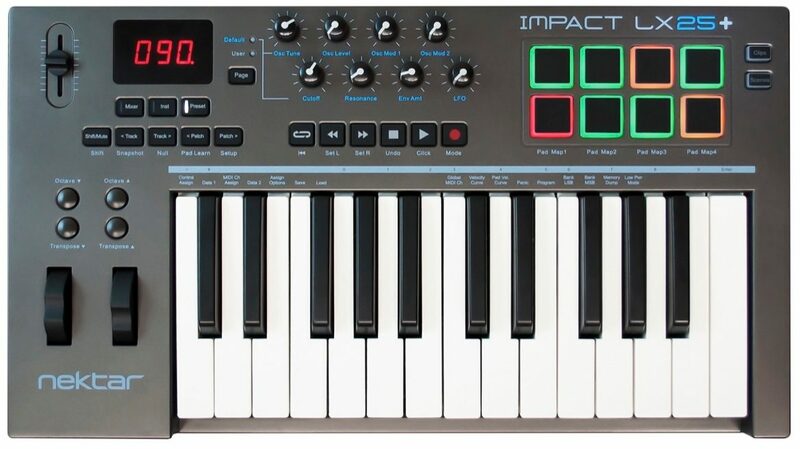 For groove and beat creation, Impact LX25+'s 8 velocity sensitive pads. Calibrated to trigger at a light touch, finger drumming is suddenly well within reach with a nice and even velocity response. The best part is the "Pad Learn" feature, which allows you to just select a pad, play the note or drum sound you want on the keyboard and assignment is done. The 4 color LED illumination indicates which pad map is currently loaded and can even tell you which type of MIDI message each pad sends. With Nektar DAW Integration, the pads are automatically mapped in for example Reason and Bitwig. The two Clips and Scenes buttons are used in Bitwig to trigger Clips and Scenes.